NikolaiRimskyK had the most liked content! NikolaiRimskyK replied to FeatherSton3's topic in Spam Topic, Forums Games, etc. .
Why Did I even sign up? We are aware when a server crashes. We usually know within minutes. It is not necessary to start multiple threads here about it. There is a Blaze/EA issue that is dropping our server and we're left helpless because of it. We do everything that we can on our end, but sometimes there is nothing that can be done. Our admins can continue to inform us through proper channels, but please, no more of these threads. @[member='Rylie_Smiley'] You need to read the general admin section. This was already covered. @[member='Laith SJ'] Could you post the date and time of your event? @[member='Rylie_Smiley'] We're testing the quality of 60hz for Metro. We can't ban everything. We'd kill the server. It would be easier to ban the complainers; which we also won't do - unless they get really out of hand. Another month is nearly over, and we appear to be coming up short in donations for the Battlefield servers once again. Last month we made around 50% of our goal. Due to last month's shortfall, we shut down the #6 server. We will be shutting down US#1 this month if we cannot achieve 100% of our donation goal by February 22nd. Every little bit helps. If you enjoy our servers, please let people know that they only stay up when we get donations. Please Read: You must be a full ADK member to join the ADK Gamers platoons. 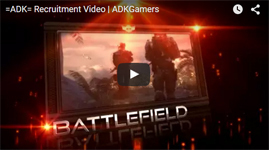 If you are a full ADK member, you MUST wear ADK tags in Battlefield. (You might remember this rule when you first applied) See here: https://i.gyazo.com/f25854de983454e3e37cd373cf1a8ab0.png When you want to join an ADK platoon, respond to this post with your in game name (IGN). Please type your username exactly as it appears in Battlelog. In order to ensure you get accepted into the platoon, and stay in the platoon, please update your IGN in your forum profile so we can link your BF profile to your forum profile. If you remove your tags to play with your friends in another platoon and we don't know about it, when we go through the platoon to verify members, you might be removed from the platoon. (See the link above).